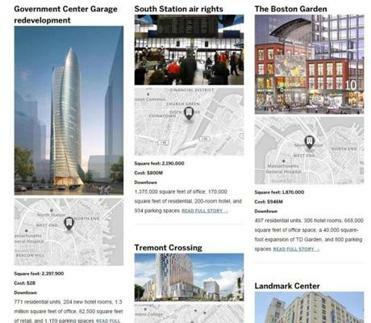 Last year, the City of Boston asked developers for ideas on how to redevelop the crumbling, closed Winthrop Square Garage in downtown Boston, and this week, eight companies delivered. While each developer proposed building a version of a tall mixed-use tower, their visions for the area — detailed below — vary widely, from a proposal to construct among the city’s tallest buildings to another that would include a new $25 million public school. Accordia, in partnership with Ares Management and Starwood Hotels, is proposing a 750-foot, 56-story glass tower that gently twists and tapers towards its apex. The 800,000-square-foot building would include a 275-room Le Meridien hotel, along with condos, retail and meeting spaces, and a large public gallery on the ground floor. In its proposal, Accordia touted its status as an African-American-owned company, and said it would partner with minority investors and contractors to work on the tower. The project would cost around $530 million, the company said. 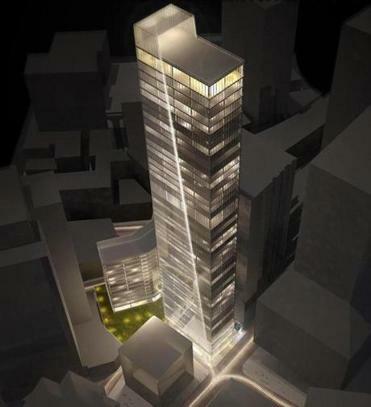 A nighttime view of the Fallon Co.’s proposed residential tower. Fallon is proposing a large, mixed-use tower around 700 feet high, with condos, apartments, and a pedestrian galleria with 30-foot ceilings and high-end retail shops. The company would also construct a shorter apartment building on the parcel. The tower would feature “a striking glass façade and unique design that will provide an airy, open feel to complement and soften the dominant masonry and granite structures, which currently define the neighborhood,” according to Fallon. 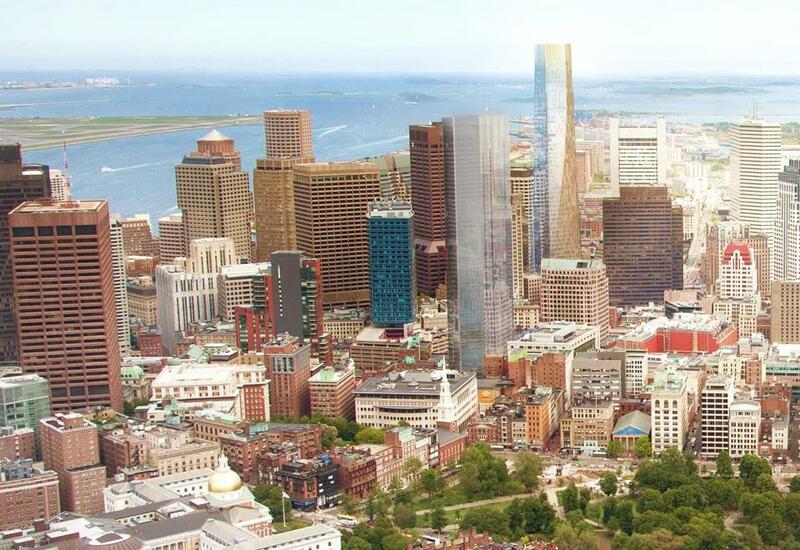 At 780 feet, HYM’s proposed residential tower would be just 10 feet shorter than Boston’s tallest building, the John Hancock Tower. Intriguingly, the company run by former Boston Redevelopment Authority director Thomas O’Brien is partnering with the Franciscan Friars of Holy Name Province. 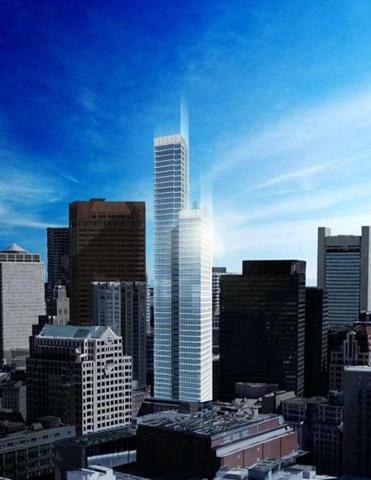 The 69-story building would be constructed on the site of the nearby St. Anthony Shrine & Ministry Center, while the Winthrop Square Garage site would become a new public plaza surrounded by a new St. Anthony Shrine Church, a new friary and ministry center for the Franciscans, and a new public school. Under its proposal, HYM would provide $25 million to build the school, then permanently lease the land back to the city. The tower would contain 700 condos and apartments, with a public parking garage underneath. The developer has not yet finalized a design and did not provide a detailed rendering to the city. The two developers are proposing a 750-foot, 68-story mixed use building containing condos, apartments, five floors of office space, retail, a 300-room flagship hotel spanning 15 stories, and an underground garage with spaces for 580 vehicles. They say it will be similar to one Graziani + Corazza designed in Toronto, called Aura, with a wide “podium” at the base containing retail shops topped by a narrower tower set back from the street. The companies are currently working on a design and did not provide a rendering. Lend Lease is a large international company headquartered in Australia; its Boston office is also working on the redevelopment of Clippership Wharf in East Boston. Hudson Group chief Ori Ron is a local developer who recently finished building the curved, 26-story Radian apartment building on Kingston Street. Unlike other proposals that emphasize residences, Lincoln is proposing a 45-story office tower. The sleek glass building would include six floors of condos and a 250- to 300-room hotel, but the bulk of its space — 750,000 square feet — would be offices. The company did not provide a rendering of its project. Lincoln previously helped develop the office building at Two Financial Center, and a 17-story Northeastern University dorm at 291 St. Botolph St., while Group One has worked on a series of hotels. Millennium, best known for the 60-story Millennium Tower currently under construction downtown, wants to build a 750-foot skyscraper on the Winthrop Square site. The building would include 360 residential units. However, nearly half of its total area, 325,000 square feet, would be office space. Lower stories would include 41,000 square feet of retail space. The developer said in its application that it would partner with the Asian Community Development Corporation and commit $10 million towards affordable housing in Chinatown. 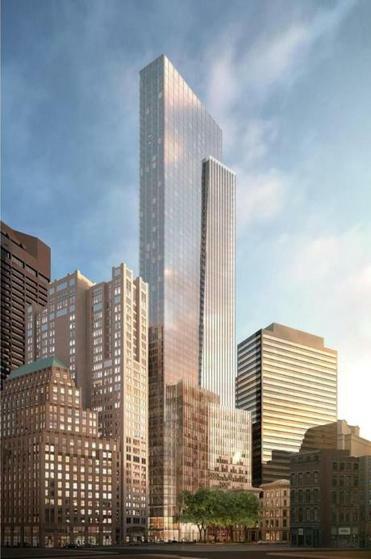 Architect: CBT/Childs Bertman Tseckares Inc.
Trans National’s proposed 54-story tower. Trans National Properties head Steve Belkin knows the Winthrop Square property well, having proposed building Boston’s tallest skyscraper here 10 years ago. That project died amid the recession and worries that the 1,000-foot building would interfere with air traffic. His new plan, led by former Normandy Real Estate Partners bigwig Justin Krebs, is for a staggering 1.5 million-square-foot tower, standing 740 feet tall and spanning 54 stories. The project would use abutting property at 133 Federal St. that Belkin owns, creating a “much larger and more dramatic development." His highly detailed proposal includes plans for 700,000 square feet of office space, plus condos, apartments, retail space, a sculpture park, and a public “Entrepreneur Innovation Center” on the first and second floors. Trinity is proposing a 51-story mixed-use project with a 276-room destination hotel, 328 luxury apartments, and 261 luxury condos. About 6.5 percent of the residences would be affordable, the developer said; Trinity also wants fees it pays to the city to go toward affordable housing in East Boston. The development would include a two-level restaurant along Devonshire Street, two additional retail spaces, and a black box theater. GB Lodging, known for its Ace Hotels in New York and Palm Springs, would develop the hotel. 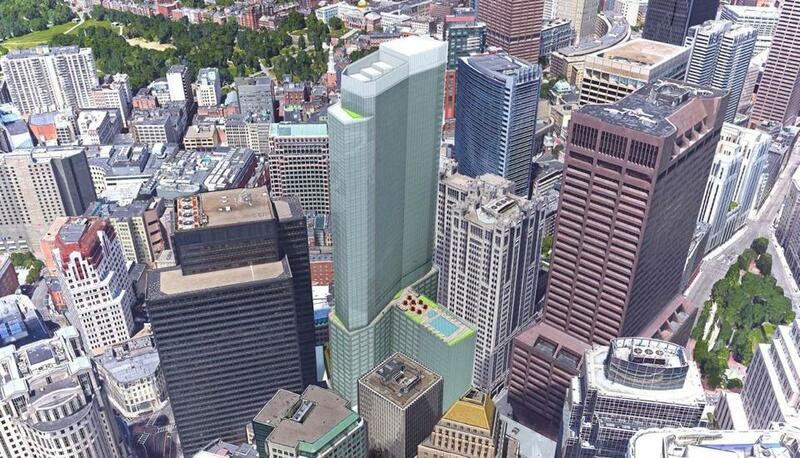 Trinity’s proposed 51-story mixed-use project.